It seems like everyone has strong opinions about potty training. Grandparents, friends, and society as a whole seem to have their own expectations about the process. It feels like a lot of pressure! We hope our mommy and daddy instinct will take over and our child will make smooth and quick progress towards potty training success. But the reality is much more complicated. Aspects of parenting. As a child development expert and mom of four, I see this a lot and want to share my top 5 pieces of advice that I wish I had known before potty training my own little ones. There is no “right” age to start potty training. If you’re the parent of a toddler, this is one aspect of potty training that’s bound to leave you scratching your head -- especially if your toddler isn’t interested yet. Fact is, there is no “right” time to start potty training. There are, however, some potty training readiness behaviors your child will display, like hiding to pee or poop, pulling at a dirty diaper, or being interested in others’ use of the potty. Any of these ringing a bell? It might be time to move forward with your family’s potty training adventure. Every child trains differently. I see tons of parents who don’t understand why their older child trained right away, but their younger one is struggling to even acknowledge the potty – or vice versa. Every child is different. You know your child’s little personality -- but did you know that personality will strongly impact the way he or she potty trains? The key to potty success is working with your child’s personality – together, as a potty training team. 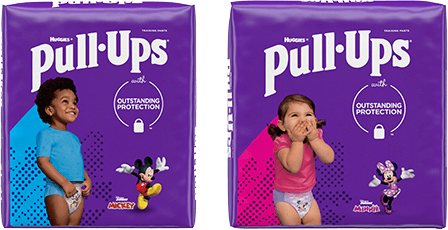 Check out the Pull-Ups® Potty Partnership, a personalized, comprehensive potty training program that’s tailored to work with your child’s unique personality, on their schedule, and according to how they learn. Setbacks are a normal part of the meandering journey of potty training. It seems like some kids seem to stay stuck in this “kinda sorta potty trained” phase forever. They’re simply too interested in friends, games, and fun to care about a wet bottom. Accidents happen, so try to have some patience and enjoy this important learning journey together with your child. Potty training doesn’t have to be a drag. Speaking of friends, games and fun, there really are ways to make potty training a more exciting experience for both you and your child. Pull-Ups® provides sticker charts, games, incentives and puzzles so that you and your little one can celebrate and take pride in this important achievement together. Potty training in both training pants and diapers can be confusing for kids. Diapers are for babies. Pull-Ups® are for big kids! When you take your child out of diapers, keep them out of diapers. Pull-Ups® are more than just a training pant, they’re also a symbol of how much your little one has grown. They’re also developmentally appropriate for toddlers, because Pull-Ups® allow them to be as independent as possible in the potty learning process. So now that you have my top 5 potty training secrets, it’s time to memorize them word for word. Just kidding, though I bet some of you out there are willing to try! What’s really important to remember is that potty training is a journey, with its own unique rewards and challenges. At the end of the day, you and your little one are learning things that – together – will help guide you both through the potty training journey – and beyond.